The attraction of wood outrigger pads. They’re inexpensive, relatively easy to make or purchase and if a pad is lost, it’s not a big deal to replace. Before making a purchase decision the critical factors of total cost, weight, and risk should be evaluated and compared to the alternatives. Wood outrigger pads have a lower up-front cost than pads made by DICA, however, wood has significant limitations. Wood is a natural material that can easily crack, break or splinter when put into use. 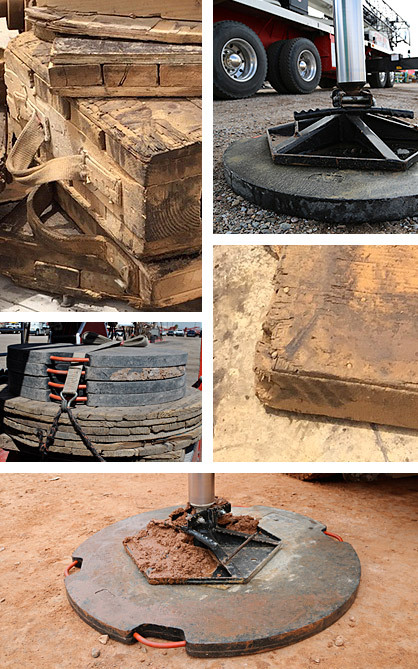 Once in the field, a wood outrigger pad will experience significant stress from equipment loads, varying soil conditions and exposure to the elements such as water, heat, and cold. These environmental factors cause wood outrigger pads to degrade fairly quickly. Even the most advanced waterproofing methods will be compromised once the initial cracking of the wood fibers occurs. The photo at the top of the page was taken of wood outrigger pads in the arid environment of Saudi Arabia. Despite very low exposure to moisture, it’s easy to see how the wood has deteriorated. Continued use of these wood outrigger pads under load distribution pressure would risk the safety of both operators and equipment. Due to these issues, it’s not uncommon for wooden crane mats to last for as little as one use and very few survive more than 1-2 years of consistent stress in the field. On a ten year timeline, a “best case” wood outrigger pad will need to be replaced up to five times. For a 24″x24″ pad used for small to mid-size outrigger-enabled equipment, the replacement cost for a wood outrigger pad will be $500.00 or more. Wood outrigger pads weigh considerably more than engineered outrigger pad products made by DICA. Using the same 24″x 24″ example above, a comparable wood outrigger pad weighs 41 lbs. In contrast a DICA SafetyTech Outrigger Pad weighs 18 lbs. That may not seem like a significant weight difference. But keep in mind the lightest a wood outrigger pad will ever weigh is the day it’s made. Once it’s put into the field, cracking will occur as the pad is put under the stress of equipment, varying soil conditions, and the elements. In a relatively short period of time, wood outrigger pads begin to absorb moisture and correspondingly increase in weight. In addition to minimizing operator fatigue, safety is an important factor. One of the leading causes of workman’s compensation claims each year are caused by lifting too much weight and improper lifting techniques. It stands to reason that if lighter outrigger pads are used, injuries and workman’s compensation claims can be reduced. Ultimately, risk is the most important factor. 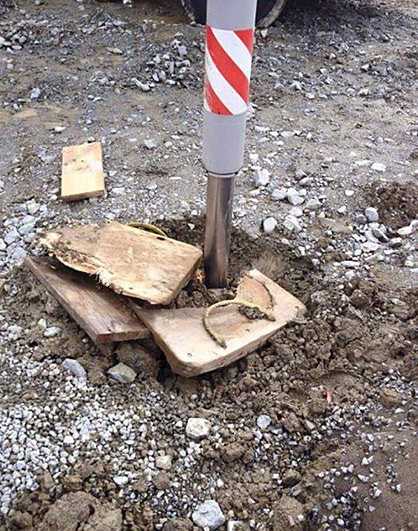 The use of wood outrigger pads is increasingly being limited by site managers on job sites. That means wood outrigger pad users run the risk of delays or lost jobs. Secondly, wood can and does break. Not only is wood breakable, but so are the fasteners used to hold the pad together. Materials such as glue and metal bolting can be easily overcome due to the stress placed on them by equipment and soil conditions. Equipment is expensive and lives are priceless, when making your outrigger pad choice, consider the difference between a product that can fail and an unbreakable alternative from DICA. SafetyTech Outrigger Pads are backed 100% by our unbreakable guarantee. Over a ten year cost of ownership, the replacement cost of a DICA outrigger pad is $0.00. SafetyTech Outrigger Pads are lighter than wood outrigger pads. Lighter means more consistent use by operators because they’re not having to lug something heavy around. Lighter also means fewer injuries and lower workman’s compensation claim costs. Again, tremendous value in a product that helps you do what you need to do. The stiffer and stronger proprietary material of SafetyTech Outrigger Pads makes them unbreakable. In comparison to wood outrigger pads, Safety Tech Outrigger Pads constructed of engineered thermoplastic are impervious to rot, absorption and delimitation and are guaranteed against splintering, cracking and breaking because of their reliable molecular, strength and stiffness properties. To learn more about our the strength, quality and molecular properties of our pads, please see our SafetyTech Outrigger Pad page. Simply put, SafetyTech Outrigger Pads won’t fail and are backed by a replacement guarantee – something wood outrigger pad never have. We have thousands of customers who’ve shared the confidence they have operating equipment that’s riding on SafetyTech Outrigger Pads. That kind of confidence brings value that makes a difference. Because of these reasons and more, DICA products are used on 6 continents and 38 countries. They can frequently be found in some of the most demanding work environments including NASA, Atomic Laboratories, DOT, DOE, military, commercial construction, utility transmission and distribution, oil and gas exploration and processing and many others. Whether wood outrigger pads are right for your business is a decision that’s up to you. We invite you to put us to the test and experience the SafetyTech Outrigger Pad difference.